Cancer is basically defined as uncontrolled multiplication of cells. On the other hand, ageing is characterised by a progressive loss of physiological integrity, leading to impaired function and increased vulnerability to death. These tables clearly shows relation of ageing and cancer in clinical scenario. 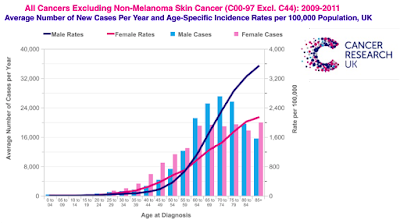 At cellular level relation of cancer and ageing can be visualised from the following image. 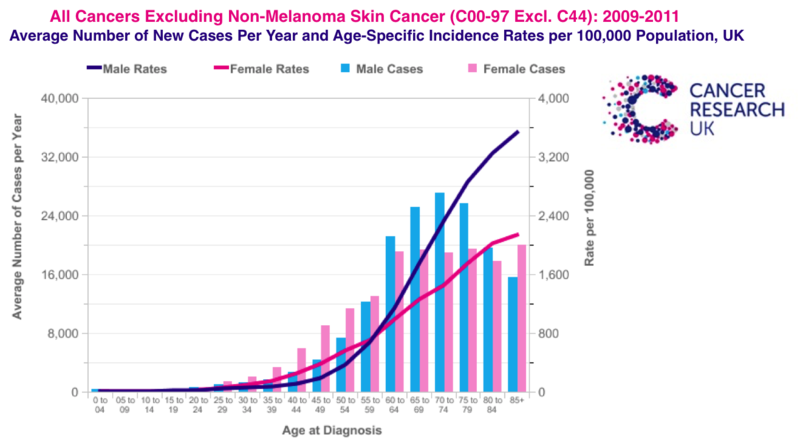 As we know that cells in cancer condition grows faster hence they also catch up to the ultimate fate of death faster as compared to normal tissue. 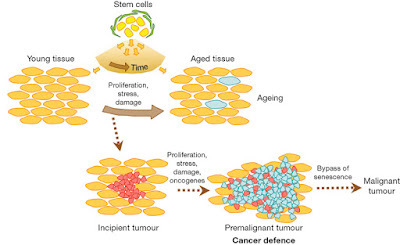 During normal ageing, stem cells accumulate damage and subsequent stress-dependent changes (for example, de-repression of the CDKN2a(INK4a/ARF) locus or telomere shortening). This leads to the increasing abundance of senescent cells (large blue cells) within differentiated tissues. Incipient tumours, arising directly from stem cells or from more committed cells, undergo rapid proliferation (small red cells). 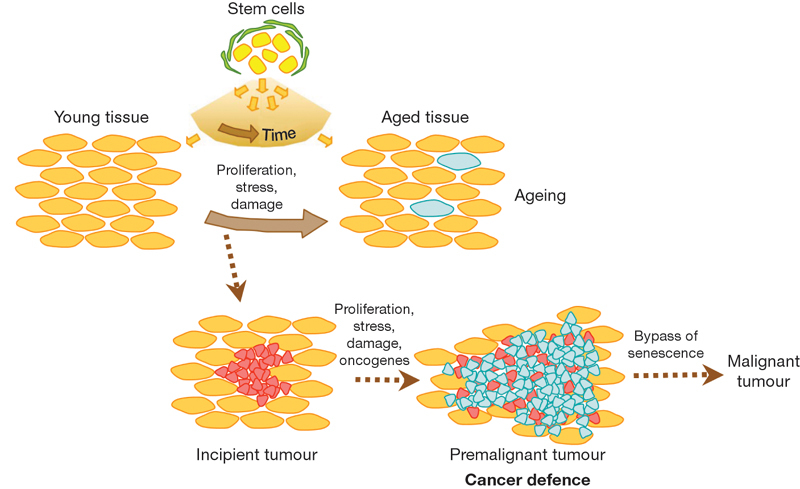 These pre-malignant tumour cells rapidly accumulate damage, in part owing to the presence of oncogenes, leading to a higher proportion of tumour cells becoming senescent (small blue cells). Tumour progression to full malignancy is favoured when tumour cells acquire mutations that impair the senescence program (for example, mutations in Trp53 or CDKN2a). Most commonly explored pathway for the treatment of ageing and at the same time cancer is m-TOR. I believe it is a wonder pathway for treatment of variety of other age related diseases. Moreover, this pathway serve as link between cancer and ageing. So inhibiting m-TOR not only stops cancer multiplication but also helps in increasing life expectancy of cells. It is ironical to say that inhibition of m-TOR helps in inhibiting two different ends of life viz. cancer (symbolises uncontrolled cell division) and ageing (symbolises death). 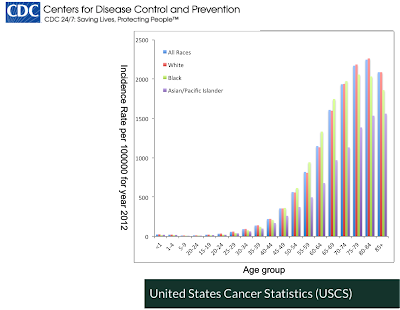 Hence, personalised cancer medicine by Pathway Pharmaceuticals and Insilco Inc. will help in developing newer strategies of increasing the life expectancy of not only cancer patients but also other individuals suffering from age related diseases. Its been long since I heard about the cure of cancer. This fatal disease runs in my family and I have lost a lot of dear family members to it. Thanx CBD.